You are here: Home / Healthy & Delicious / Is There Such a Thing as a Healthy Biscuit Recipe? Is There Such a Thing as a Healthy Biscuit Recipe? 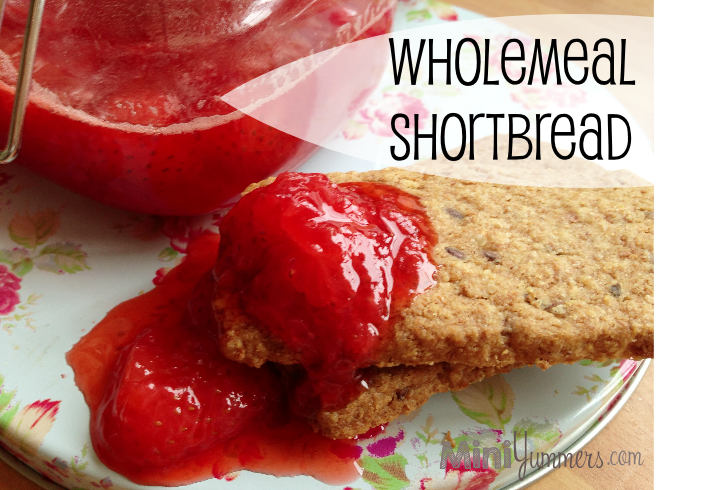 OK, so I’m not entirely sure that any biscuit can be considered healthy, but this biscuit recipe for wholemeal shortbread is certainly much healthier than most other biccies you can buy or make. The wholemeal flour gives you a fibre boost, it uses less sugar than most biscuit recipes, and to add even more health points you can dip it in our easy-to-make strawberry compote. 1. Mix together the butter and sugar until fluffy. Preheat the oven to 180c, 350f, gas 4. 2. Add the flour and work it into a dough using a spoon. 4. Use cookie cutters to cut out the dough, or use a butter knife (or similarly blunt knife) to cut your dough into fingers. 5. Bake for 10 minutes and check that they are golden. Give them a couple of extra minutes if they still look pale. Remember: Biscuits are often soft when you take them out of the oven, but will firm up as they cool. 1. Mash up the strawberries with a fork, but make sure to leave lots of large pieces–don’t squish it all to a pulp, just enough to break the strawberries into pieces. 2. 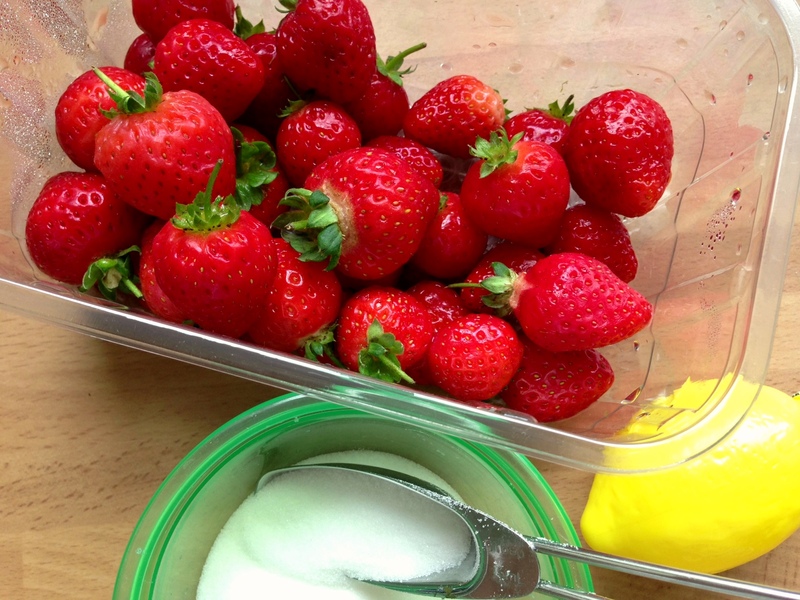 Put the strawberries into a pan with the lemon juice, water, and sugar. 3. Heat gently until the sugar dissolves (you shouldn’t be able to hear it when you move your spoon). 4. Turn up the heat a little, until you see little bubbles–this is called a simmer. 5. 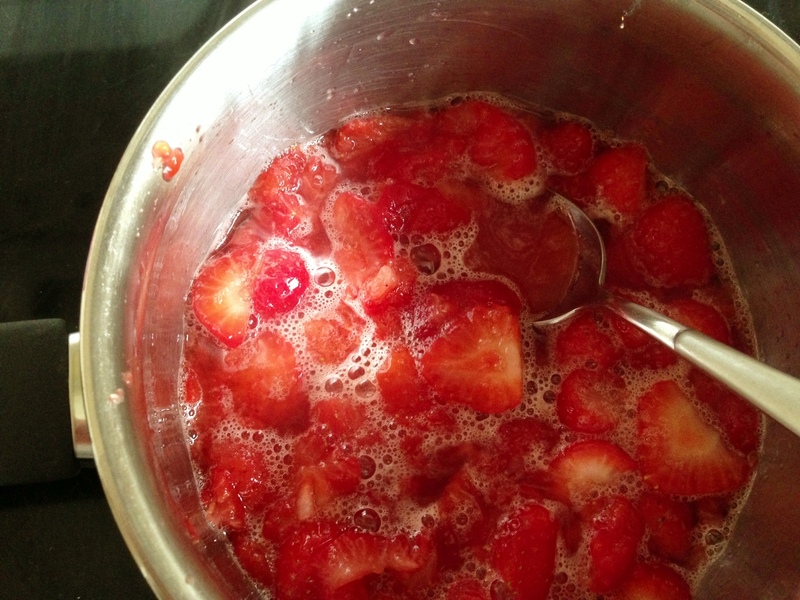 Cook for around 5 minutes, until the colour turns a brighter red and the mix looks thicker and syrupy. 6. This fruity dip can also be used on pancakes, and will keep in the fridge for up to 2 weeks in a sealed container. This healthy biscuit recipe tastes great either with or without the dip, and makes a great addition to school lunchboxes.